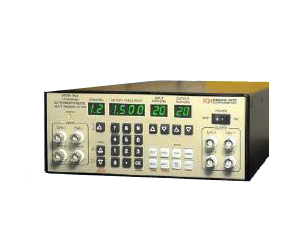 The Krohn-Hite Model 3944 is a 4-channel, Butterworth/Bessel filter offers a programmable or bench top filter covering a cutoff frequency range from 3Hz to 2MHz, with a frequency response characteristic of maximally flat (Butterworth) for clean filtering in the frequency domain, or linear phase (Bessel) to provide superior pulse or complex signal filtering. The passband gain is unity, and the attenuation slope is 24dB/octave per channel. The 3944 will accept input signals of ±4.5V peak and provides input and output gains of 0dB or 20dB which can be selected via the front panel keyboard or over the GPIB bus. The filter can be programmed to operate in any combination of four channels of high-pass or low-pass; two channels of any combination of band-pass or band-reject; or one channel of band-pass or band-reject and two channels of any combination of high-pass or low-pass. The four channels can be connected to achieve 96dB/octave of high-pass or low-pass. The Model 3944 offers to the user 99 groups of non-volatile memory for storage of front panel set-ups, which are stored in battery-backed CMOS. Set-ups can then be recalled with a simple command. The 3944 also provides a self-test diagnostics upon power-up of its internal memory to insure the unit is operating properly. If a failure occurs, the display will indicate which ROM or RAM has failed.